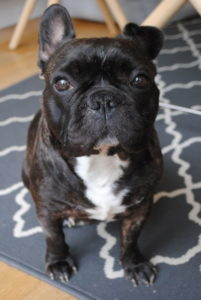 Fred the Frenchie came to us in the most awful state – he was emaciated and covered in huge open sores. Sadly an example of awful breeding and the issues these breeds can suffer. 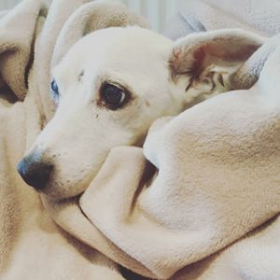 It took Fred a long time to settle into his foster home and for his foster carers to get on top of his medical issues, he was finally diagnosed with severe allergic skin disease. Fred needs very careful management to keep him comfortable day to day. He has medicated baths every few days, steroids, Apoquel, a special diet and antihistamines just to keep him stable. He will also need surgery on his airways in future. Fred is the most gentle soul (apart from if he spies a cat!!) and adores his home comforts and the company of the other dogs he lives with. Stress seems to set Fred’s health issues off, so the decision was made for Fred to stay as a long term foster dog to avoid any further upset for him. We will ensure he receives all the treatment, care and love he needs and deserves for the rest of his life.